The short answer is: yes, and increasingly more so. While the fundamentals of the American economy remain strong and the stock market flirts with all-time highs, consumers continue to grow weary about spending money on fast food. What happens on Wall Street doesn’t always trickle down to Main Street. This is supported by data; have a look at the chart below. 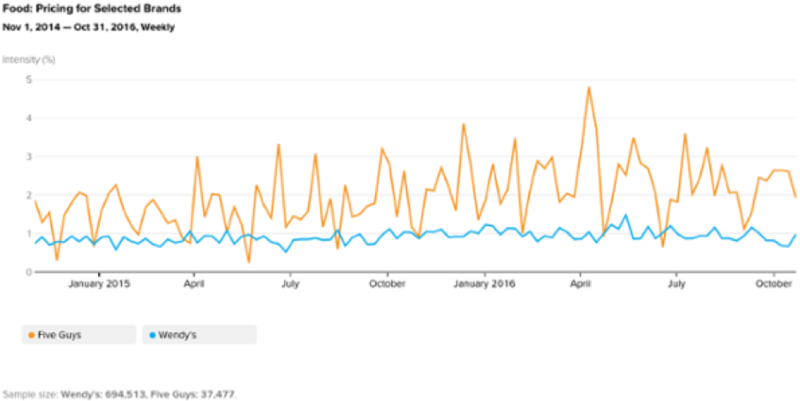 The blue line shows the increase in the amount of conversations predictive of sales in the QSR burger category over the last 4 years. At the beginning of that period, starting in May 2012, the 3-month average of these customer conversations in the burger space was .73%. In the final three months of the chart that number climbed to 1.3%. That's 81% growth over a 4-year span. A perceptive reader might stop here and ask: Wait, just because the number of price conversations are up doesn’t mean those conversations are negative, right? What if people are discussing the great value of these burgers? The answer to those fair questions comes by way of sentiment. Note the green and red areas of the chart; those represent sentiment. From May of 2012 until around January of 2015 the sentiment around pricing was fairly even. In other words, the green and red areas were about the same size. But since that moment in early 2015, sentiment has clearly skewed negative. In the last three months sentiment around prices in the burger space has been 72% more negative than positive. Stated another way: over the last 3 months, 72% more fast food burger customers think the burgers are too expensive vs. being a good value. Why is this happening? The best answer is the falling price of groceries. On a recent earnings call, Todd Penegor, the CEO of Wendy’s himself admitted “It’s gotten a lot cheaper, relatively speaking, to go get fresh beef at your local butcher and go home and grill it.” This is backed up by the fact that prices for uncooked beef are down almost 9% from a year ago, mainly because the corn used to feed cattle is also cheaper. Put more succinctly, fast food chains are losing revenue to grocery stores. What are some takeaways here? Restaurants concerned about customer unease should seek to establish price stability. Take a look at this chart. Notice how flat the blue conversation line is for Wendy's pricing, and how erratic the orange conversation line is for Five Guys, both over the last 24 months. Wendy's wants consumers to walk into any of their chains expecting burgers and fries – at a low price point. On the other hand, Five Guy's customers are all over the place about regional pricing and incremental cost changes, and it’s making them nervous. Many Americans are still facing economic challenges causing them to rethink their spending habits. Fast food hamburgers aren’t immune to potential household budget cuts, and the data bears this out. In response, QSRs should continue to provide economic value, with consistent prices.